Open Baskerville is an ongoing open source project to create a digital revival of the famous ‘Baskerville’ typefaces. 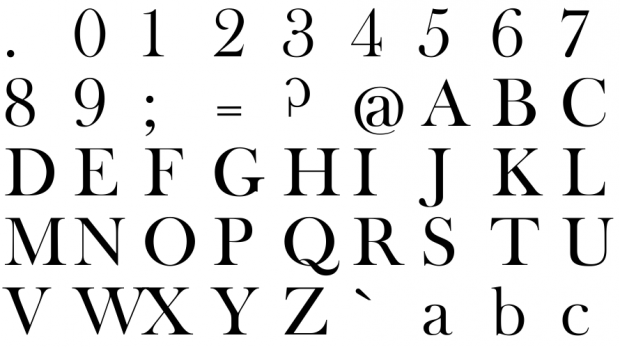 Open Baskerville is based upon Fry’s Baskerville, a Baskerville-inspired derivative created by Isaac Moore, a punchcutter who worked for the type foundry of Joseph Fry. Even though the prospect of collaborative open source type development upsets some type designers, the project has been inspirational for other open font initiatives, like the League of Movable Type, the OSP Foundry and The Open Font Library. Because Open Baskerville is open source it is free to download, use and modify (on this site the headlines are set in Open Baskerville). As a design project, Open Baskerville is remarkable because it appropriates software development tools to enable typographic collaboration. The project was initiated by Simon Pascal Klein, based on work by James Puckett. Since then Eric Schrijver has been acting as a project lead, gathering designers and developers around the project and implementing a collaborative workflow. To learn more about how to collaborate, visit the project website. The font files are in the open UFO format, that is usable in all major font editors. We store the file modifications in a system called Git, that was developed by Linus Torvalds, the inventor of Linux. With Git, different designers maintain their own ‘fork’ of the typeface, and they can exchange their changes. This distributed approach helps to avoid a design by committee result. Because Git has initially been developed for software development, its interface can proove inacessible to designers. The code hosting website Github has helped us out tremendously, by implementing previews of the font folder, and a visualisation of the differences inbetween different versions of the typeface. Download link does not seem to be working any more? The download link above returns a “not found” error, as does the root get.schr.fr. Is the font not available as a zip now? Separately has the funding been found to organise a scan of the font specimen in the Swedish National Library? If not and if it is still of interest I may be able to get that sorted for the project.